This programme is designed to give you a good grounding in both the science of bioprocessing and the management of new emerging technologies in healthcare. You will develop an understanding of the latest biomedical and diagnostic advances, together with the business skills necessary for health and clinical research management. Biology, Chemistry or Physics required. A total of 18 points in three higher level subjects including one of Biology, Chemistry or Physics, with no score below 5. A total of 16 points in three higher level subjects including one from Biology, Chemistry or Physics, with no score below 5. Not acceptable for entrance to this programme. D3,D3,D3 in three Cambridge Pre-U Principal Subjects, including one from Biology, Chemistry or Physics. AAA at Advanced Highers (AA at Advanced Higher and AAA at Higher), including one of Biology, Chemistry or Physics at Advanced Higher. Successful completion of the WBQ Advanced Skills Challenge Certificate plus 2 GCE A-Levels at grades AAA, including one of Biology, Chemistry or Physics. This BSc is a truly interdisciplinary programme. It draws on the knowledge of experts from across UCL in science, engineering, management and humanities. The department has among the most modern and comprehensive biochemical engineering facilities of any university in the world. Valued at over £35 million, our facilities attract leading industrial collaborators. Our teaching is designed to help you work at a detailed analytical level and also see the bigger picture in terms of addressing environmental and ethical issues. We have been pioneers in providing our undergraduates with training to help them understand the business environment in which the life science industries operate. This will prepare you better for your future career. In the first year, you will study the basics of how a drug is created, made at scale and what the challenges of creating new medicines are. You will also study the prerequisite management principles involved in running an organisation and dealing with the accounts, as well as the fundamentals of data management. In year two you will study the internal and external factors that govern pharmaceutical production, with emphasis on clinical needs and their constraints. A wide spectrum of knowledge is encompassed, from statistical analysis to legal and ethical concerns. You will also grow to understand the role of the Internet in globalisation and access to medicines. The third year addresses a more in-depth understanding of global practices, business planning, and the feasibility and economics of creating therapeutics and vaccines in both developed as well as developing markets. You will also undertake an independent bioprocess research project. You will select 0.5 credits from a range of options. You will be taught through a combination of lectures, case studies, team-based projects and experiments. Leading industrialists and researchers regularly visit the department to provide guest lectures. Case studies are conducted in small teams, and your personal and departmental tutors are available to offer individual support. Written examinations, individual reports, coursework and oral presentations all contribute towards your assessment. 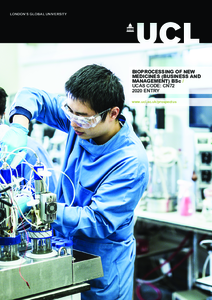 Detailed course descriptions are available on the department website: Bioprocessing of New Medicines (Business and Management) BSc. The core science, engineering, business and leadership skills that you acquire on the programme will provide you with excellent and diverse career prospects. In addition to your core subject knowledge, the programme will provide you with skills such as innovative thinking, team-working and computing. The excitement of advances towards new medicines and greener sustainable processes is creating an ever-growing need for biochemical engineering graduates in the biotechnology, pharmaceutical, biofuels, chemical, environment and food industries. You may be based in a university, or elect to work in company research and development activity that is involved in the design of facilities and the creation of safe materials. The programme teaches skills in systematic thinking and precise calculation, leading some graduates to enter the financial sector (particularly those companies which invest in healthcare). Several major international companies have established a trust fund with the department. This fund provides five bursaries, each worth at least £1,500, which are open to all applicants of this programme. In addition to academic requirements, we will use your application to assess your motivation for studying bioprocessing. We will be seeking applicants committed to studying at the highest level, who are eager and able to rise to the challenges presented both by the programme and by a career in the discipline. If we have made you an offer, you will be invited to an offer-holder's open day. This provides an excellent opportunity for you to visit the departmental facilities and meet current students and staff before making a final decision. If you live outside the UK, or travel distance is a problem, we will arrange for a telephone or online (VoIP) chat to assist with any questions you may have. We are happy to consider your application if you wish to defer entry and take a gap year before taking up your place on the programme, especially if you have constructive plans for your time. The Year in Industry scheme provides suitably qualified students with work placements, allowing them to gain relevant work experience whilst earning money.